On February 10, 2007, Vladimir Putin delivered a speech at the 43rd Munich Security Conference that created a rift between Washington and Moscow that has only deepened over time. The Russian President's blistering hour-long critique of US foreign policy provided a rational, point-by-point indictment of US interventions around the world and their devastating effect on global security. "I am convinced that we have reached that decisive moment when we must seriously think about the architecture of global security. And we must proceed by searching for a reasonable balance between the interests of all participants in the international dialogue." With that one formulation, Putin rejected the United States assumed role as the world's only superpower and steward of global security, a privileged position which Washington feels it earned by prevailing in the Cold War and which entitles the US to unilaterally intervene whenever it sees fit. Putin's announcement ended years of bickering and deliberation among think-tank analysts as to whether Russia could be integrated into the US-led system or not. Now they knew that Putin would never dance to Washington's tune. In the early years of his presidency, it was believed that Putin would learn to comply with western demands and accept a subordinate role in the Washington-centric system. But it hasn't worked out that way. 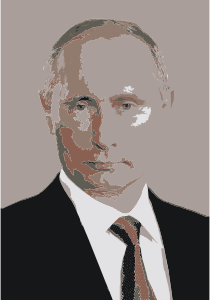 The speech in Munich merely underscored what many US hawks and Cold Warriors had been saying from the beginning, that Putin would not relinquish Russian sovereignty without a fight. The declaration challenging US aspirations to rule the world, left no doubt that Putin was going to be a problem that had to be dealt with by any means necessary including harsh economic sanctions, a State Department-led coup in neighboring Ukraine, a conspiracy to crash oil prices, a speculative attack of the ruble, a proxy war in the Donbass using neo-Nazis as the empire's shock troops, and myriad false flag operations used to discredit Putin personally while driving a wedge between Moscow and its primary business partners in Europe. Now the Pentagon is planning to send 600 paratroopers to Ukraine ostensibly to "train the Ukrainian National Guard," a serious escalation that violates the spirit of Minsk 2 and which calls for a proportionate response from the Kremlin. Bottom line: The US is using all the weapons in its arsenal to prosecute its war on Putin.